How can I verify payment options on an existing form? 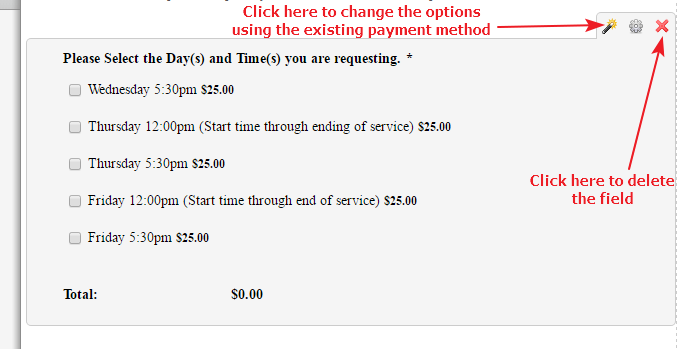 I have a form and I want to check the payment options for that form. But when I select forms, it stated that I have to delete the current form. However, I cant find the option to delete the current payment. I'm not sure if I understand your query correctly. Do you want to change the payment option on your JotForm? I see that you are using PayPal payment on your JotForm. If you want to change the payment method to any other method, you may delete the payment field from the form and then add the new payment method. If you want to change the payment options in the payment field, you may click on wizard icon to access the payment wizard and change the options. Hope this information helps! If you are referring to something different, please let us know. We will be happy to assist. Thank you!! That's what I was looking for.